The chief prosecutor of the International Criminal Court (ICC), Fatou Bensouda, has offered “her deep sympathy to the victims of the appalling attack” in Kenya and is ready to assist the Kenyan government bring the perpetrators to justice. The Somali based al qaeda syndicate, al shabab have claimed responsibility for the deadly Westgate mall attack which has left a death toll of over 60 and 200 injured. Al-shabab says the attack was in retaliation for Kenya’s 2011 border incursion. 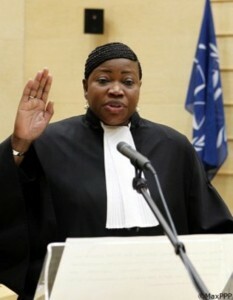 Chief prosecutor Fatou Bensouda also said in a statement that the attack “may constitute a crime” under the founding Rome Statute of the ICC, which Kenya subscribes to. “With full respect for the primacy of the jurisdiction of the Republic of Kenya, the prosecutor stands ready to work with the international community and the government of Kenya to ensure that those responsible are brought to justice”, Bensouda added. The statement comes after ICC judges allowed Kenyan Vice President, William Ruto, return home to help his country deal with the deadly Westgate shopping mall attack.